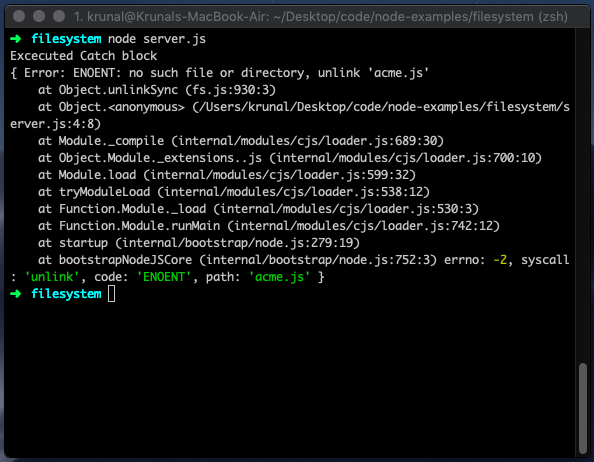 Node js File System Module Example Tutorial is today’s leading topic. 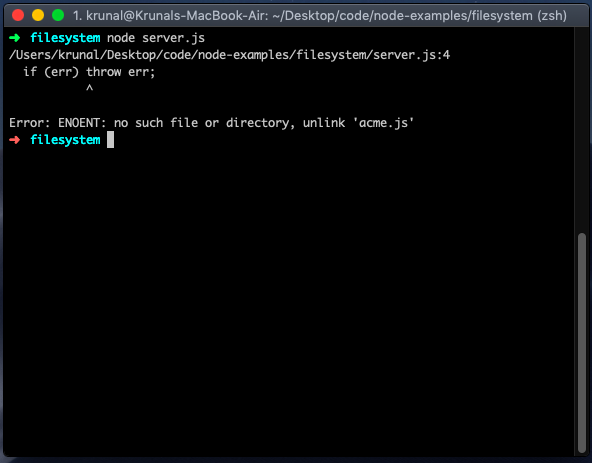 The Node.js file system module allows you to work with a file system on your computer. We can include the File System module by using the require() method. The fs module provides the API for interacting with a file system in a manner closely modeled around standard POSIX functions. All node.js file system operations have synchronous and asynchronous forms. The asynchronous form always takes the completion callback as its last argument. The arguments passed to a completion callback depend on a method, but the first argument is always reserved for the exception. If the operation was accomplished successfully, then the first argument will be null or undefined. 8 #Writing a File using Node fs module. 9 #Reading a file using node fs module. The everyday use for the File System module is as follows. We can require the fs module like the following code. Let us take the example of simple file system operation in which we remove the file from disk. Create one folder called filesystem and get inside that folder. Now, create one file called acme.js inside the root for just demo purpose. We will delete this file using the fs module. So type the following code inside the server.js file. Now, run the following command in your terminal. It will give you the output like this and your file will be deleted from the project. You can wrap the above operation in the try-catch block. Let us say we have already deleted the file and again we try to run the command then we will get the following error. So, we need to define the try-catch error mechanism. Also for that, we need to perform the sync operation and not async operation. So, we have used the fs module’s unlinkSync function. Most fs operations accept file paths that may be specified in the form of a string, a Buffer, or a URL object using the file protocol. String form paths are interpreted as UTF-8 character sequences identifying the absolute or relative filename. Relative paths will be resolved relative to the current working directory as specified by the process.cwd(). Recreate the acme.js file inside the root. Write the following code inside the server file. For most fs module functions, the path or filename argument may be passed as a WHATWG URL object. Only URL objects using the file protocol are supported. The syntax is following to open a file using node fs module. Flags for reading/writing operations are the following. r Open a file for reading. An exception occurs if a file does not exist. r+ Open a file for reading and writing. An exception occurs if the file does not exist. rs Open a file for reading in synchronous mode. rs+ Open a file for reading and writing, asking the OS to open it synchronously. See notes for ‘rs’ about using this with caution. w Open a file for writing. The file is created (if it does not exist) or truncated (if it exists). wx Like ‘w’ but fails if the path exists. w+ Open a file for reading and writing. The file is created (if it does not exist) or truncated (if it exists). wx+ Like ‘w+’ but fails if the path exists. a Open a file for appending. The file is created if it does not exist. ax Like ‘a’ but fails if the path exists. ax+ Like ‘a+’ but fails if the path exists. Let us take an example of opening a file using the node fs module. You can run the file and see the output. If the file exists then, it will open in the mode of r+. Following is the syntax of the method to get the information about a particular file. Let us take an example of node file stat. Run and see the output in the terminal. #Writing a File using Node fs module. 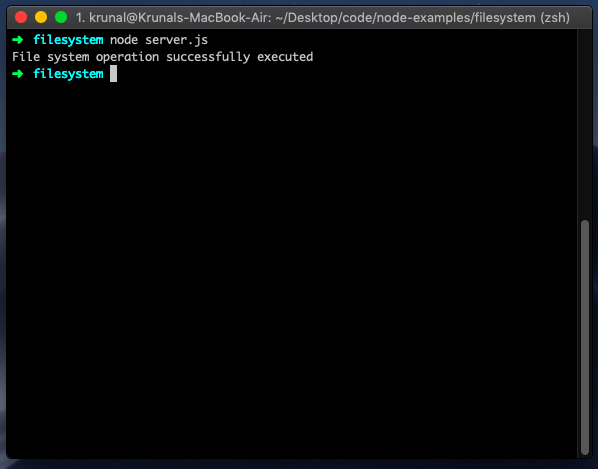 The syntax is following to write a file in node.js. This method will overwrite the file if a file already exists. If you want to write into an existing file, then you should use another available method. #Reading a file using node fs module. To read a file in node.js, you can use the following syntax. Let us take an example and understand how we can read the file using the node fs. The above code will spin up the http server and return the content of the file in the webpage. You can access the webpage at this URL: https://localhost:8080. To rename a file with the File System module, use the fs.rename() method. The fs.rename() method renames the specified file. To delete a file with the File System module, use the fs.unlink() method. The fs.unlink() method deletes the specified file. Run the file and the file will be removed from the disk. 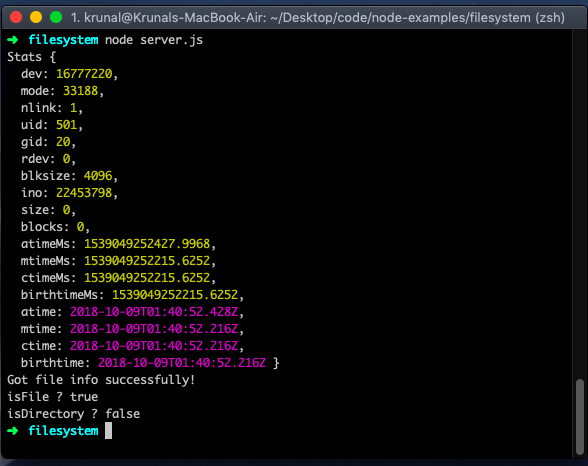 Finally, Node js File System Module Example Tutorial is over. Thanks for taking.